"During the 1930's and 1940's many varied public works and construction projects were completed by the WPA (Works Progress Administration) within the Town of Wakefield. These projects ranged from the typing of Town records in 1934, to the remodeling of the Lafayette School into municipal offices and veterans' office quarters in 1937, to the construction of eight newly accepted streets and several sidewalks in 1937. In 1939, Wakefield Selectmen voted to ask the Special Town Meeting to build a bath house on Spaulding Street at Lake Quannapowitt, as well as other recreation projects, using ther skills of WPA workers at an estimated cost of $2,000. Just one week later, the estimated cost rose to $5,500 a fact that created debate within the community. The WPA Supervisor was asked to submit other plans which were not so elaborate which would 'entail a smaller expenditure to the Town and yet produce a satisfactory bath house,' the Selectmen feeling that the proposed bath house could not be erected for that amount of money. New plans were submitted by the Wakefield Rotary Club's community service committee which reduced the proposed costs from $5,500 to between $3,500 and $3,000. The building would not be made of brick as in the previous plans and would not be heated for winter use. The bath house could accommodate 100 boys and 100 girls and would be a modern building with asphalt shingles. 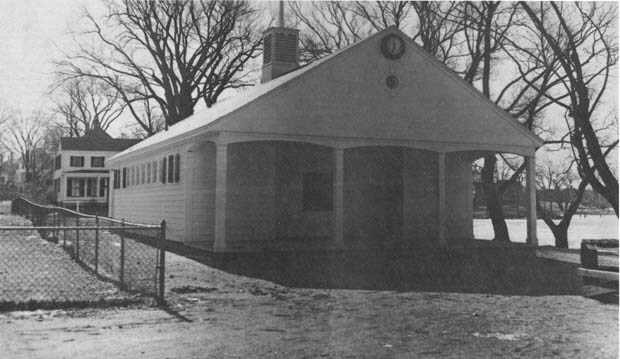 On March 23, 1939, Special Town Meeting voted to build the bath house at a cost of $5,261 by a close vote. The Spaulding Street bath house was completed in 1940 for a cost of $6,882.59. The bath house was removed in 1994 to the Forest Glade Cemetery." -- Text from calendar by Jayne M. D'Onofrio. “Bath house, Lake Quannpowitt, 1940,” NOBLE Digital Heritage, accessed April 22, 2019, https://digitalheritage.noblenet.org/noble/items/show/6871.